Vector 2 APK is now available in the latest version 1.0.6. This game is still carrying similar gameplay from its predecessor the runner action with fully animated and impressive parkour style. This game has only 2D graphics but I was impressed with the smooth animation. Thing that is different with the old version is the location of the escape. In Vector 2 you will adventure in dangerous lab complex. Seems to be more of challenge! There are many pitfalls and obstacles are waiting for you in each corner of the game. The storyline is also quite different from the first Vector game. Here you are not a human being, and your character will not die when you failed to pass certain obstacles. But these games are randomized so your gaming experience will always different. Not Just a new location, you will find some new features. There is also equipment power ups and abilities that you can use to change your game style. If you can utilize this equipment properly, your chance to run to reach the farthest distance more easily, so your score will also be higher. After playing couple hours, I really like the gameplay. This is fun runner game. It’s not a lot of new things, but the animation that you get is truly amazing and makes you forget the time. I admit, this is 2D runner game with the most attractive appearance this month. Try out experimental high-tech gear that will help you survive a little longer and discover ways to upgrade it. 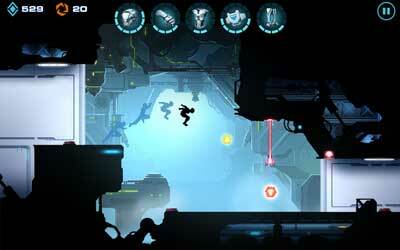 RUN FOR YOUR LIFE : Descend through a huge and complex research facility and try to get out alive – over and over again. GEAR UP : There’s no good run without good equipment. Magnetic Manipulator — collect every item you see! EMP Controller — activate to disable visible traps! This game is better than the previous one. New levels, really cool. Great game. I love the new moves and the technology aspect of the game is an awesome touch.